Stay warm & enjoy music and calls hands free! This beanie is made of soft and durable material and the electronics inside don't stick out or add a lot of bulk. Simple & Stylish, it keeps your head and ears warm while allowing you to make calls and listen to music hands free. This great light to medium weight beanie with built-in speakers & microphone not only gives you warmth but also syncs it to your device. How cool is that! A great gift idea for the busy phone chatter, music lover, or outdoorsman on your gift list. See the complete review of this 2016 Ultimate Holiday Gift Guide Item HERE. 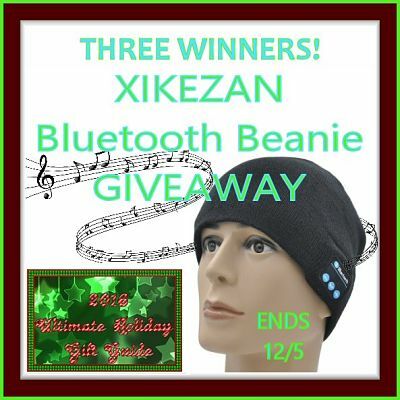 Now thanks to this great sponsor three lucky readers have a chance to enjoy wearing this Bluetooth Hat for free. Just enter on the widget below. a Rafflecopter giveaway Can't Wait For The Giveaway To End?